Published anonymously during the resurgence of the antislavery campaign in Britain, Moses E. Levy's pamphlet, "A Plan for the Abolition of Slavery," stands without parallel. The appearance of this publication in 1828 London, established Levy as the first and only Jewish abolitionist author amid a plethora of mostly Evangelical stalwarts. 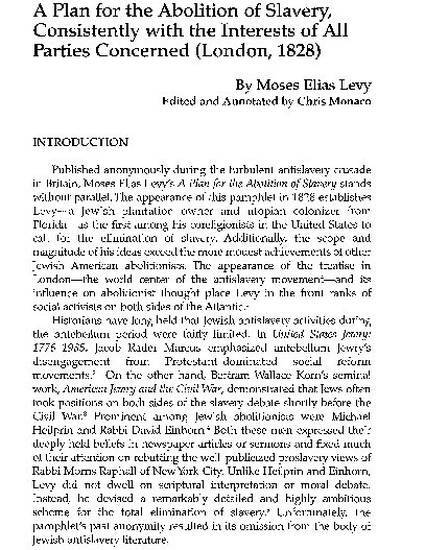 The scope and magnitude of Levy's ideas exceeded the more modest attempts by a small cohort of Jewish antislavery advocates who appeared much later in the United States. The entire pamphlet is reproduced here and, for the first time, extensive annotations by C. S. Monaco places this work into historical perspective.